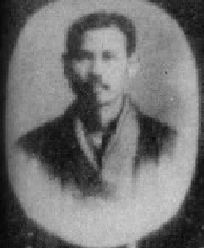 Gichin Funakoshi is well known as having had two teachers: Yasatsune (Anko) Azato and Yasatsune (Anko) Itosu. As I pointed out in my previous article, the adjacent group photo shows Funakoshi (already a karate master in his own right) and some school students just before a demonstration to Prince Hirohito in 1921. 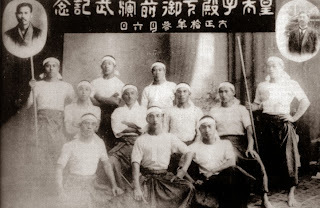 I have tentatively concluded (see my previous argument) that it is Funakoshi's teachers - Azato and Itosu - who are shown in the inserts (as was custom, particularly when you consider that the photo was used by Funakoshi in his 1922 book "Ryukyu kempo"). This leaves only one real question, and this is who is Azato and who is Itosu? Having just deduced (with, I think, good reason) that the person in the right insert must be Itosu, it follows that the person on the left is Azato. In other words, we have, for the first time, a reasonably identifiable picture of Anko Azato! 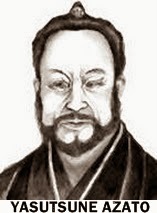 He is certainly quite distinct from the drawings we've previously seen (see on the left) - just as distinct as the photos of Itosu are from most of the drawings depicting that master. So finally we have a photograph of the mysterious Yasatsune "Anko" Azato - the only "known" one (see to the right). In other words, here is the face of Funakoshi's other principal teacher - the man who might very well have taught him techniques such as the "haiwan nagashi uke" which the shotokan school uses in its tekki (naihanchi) shodan kata (as opposed to the chudan uke done at this point in most other Itosu-based schools). On that (hopefully interesting) observation, I'd like to thank all my readers for their patronage this year and wish you all a very happy 2014!